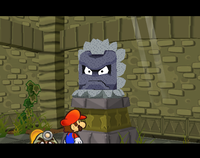 —Thwomp, "Never Koop a Koopa"
Thwomps, also known as Thwomp Traps, are giant stone faces found mostly in the Mushroom Kingdom. They are normally depicted as spike-encrusted living stones that are usually rectangular in shape and made their first appearance in the game Super Mario Bros. 3. They typically attempt to fall on and flatten or squash whoever passes below them, although some move horizontally or diagonally as well. They can only be destroyed by Hammer Mario's hammers, Statue Mario, Gold Mario's fireballs, getting tapped while the player is under the influence of a Boost Star, or by being touched when Mario is giant or invincible. It is suggested in Mario & Luigi: Partners in Time that Thwomps may in fact be born from volcanic activity. 1.5.4 Mario Kart: Double Dash!! Thwomps make their debut appearance in Super Mario Bros. 3. They usually try to squish Mario under their weight whenever he passes beneath them. While most of them try to crush Mario below them, some try to crush him from the sides. Thwomps are possible to be easily avoided by using the Statue Mario ability. With this, it is impossible for Thwomps to destroy Mario by crashing him from above. They return in the game's remakes, Super Mario All-Stars and Super Mario Advance 4: Super Mario Bros. 3 in the same fashion as the older Thwomps. They feature improved graphics and retake their especially mad expressions. Curiously, these Thwomps have a "bigger spike" on top of their forehead, separated from the rest of the body by what looks like a small ribbon of sorts. This spike is prominent in appearance but has no effect in the game. It is also worth noting that these Thwomps, instead of having their eyes separated, have both eyes as glowing dots in a black space. This is most likely due to palette and space limitations. This may also factor into why they look pale blue in many stages of the Nintendo Entertainment System version of Super Mario Bros. 3. There are three ways to defeat Thwomps in this game. The first is running into a Thwomp while invincible. The second is to throw a Hammer at it with the Hammer Suit. The third is by using the Tanooki Suit and turning into Statue Mario above a Thwomp. They give the player 100 points when beaten. In the GBA version, Thwomps can also be defeated with a Goomba's Shoe, as shown in the World-e stage It's a Shoe-in. Thwomps, alongside other enemies such as Boos and Dry Bones, are some of the few Super Mario Bros. 3-introduced enemies that keep appearing in later games. Thwomp itself makes a new appearance in Super Mario World, now redesigned and recolored due to the expansion of the palette. Unlike old Thwomps, they are now gray-colored and have lost the prominent spike on top of their head; now all spikes look exactly the same and are the same size, relatively, while the Thwomps themselves are noticeably smaller. They reprise their role as the smashers and will try to squish Mario or Luigi without a second thought. Their speed is almost unaffected, and usually take a few seconds to rise up to their original place once again. This gives the player a chance to run below them. Unlike in the previous game, they now have more than one expression, peering down at the player's character when he approaches, and then taking on an enraged face when falling. Thwomps have their first derived species in Super Mario World with the inclusion of Thwimps. They are smaller versions of Thwomps that roam around in jumping arcs, usually in small hallways and often come in groups. Much like Thwomps, they are invincible and are usually only used as obstacles that slow the player down. Thwomps still have their eyes connected and their pupils being but small dots of glowing white, although the official art clearly shows their eyes looking different. This may be to familiarize players with their old physical appearance, though it might be due to graphical space issues. They are described as "nasty stone ghosts" by the manual. Thwomps also return in most compilations made for the Super Nintendo Entertainment System, such as Super Mario All-Stars, as well as the Satellaview's BS Super Mario Collection. Thwomps return in Super Mario 64. This time, though, Thwomps return in a much different fashion, and look more like they did in Super Mario Kart. These Thwomps are square-shaped and dark sky blue-colored with no spikes. They, as before, are impossible to destroy and serve as obstacles throughout the game. Unlike the previous games, Thwomps constantly slam to the ground even when Mario is not around. This time around, though, Mario can use Thwomps to his advantage by jumping on top of them to reach higher areas or unreachable points. Thwomps in this game have the addition of their voices (a mad grunt) whenever they slam into the ground. There are only three Thwomps in the game: two on the stairs in Whomp's Fortress and one in Tick Tock Clock, at the very top of the stage, which is featured in the mission Stomp on the Thwomp. Several new species of Thwomp make their debut in Super Mario 64. Whomps first appear in Whomp's Fortress as enemies that attempt to crush Mario by falling on top of him when he gets near. Also introduced in this course are Bomps, enemies that resemble walls with eyes (although the eyes were removed in Super Mario 64 DS) that protrude out from the wall and push Mario, sometimes sending him to his death. Tox Boxes make their debut in Shifting Sand Land. They roll around by falling on their sides, trying to crush Mario with one of their faces. However, the bottom of the Tox Box is hollowed, allowing Mario to stay safely inside. Grindels make their first appearance in the pyramid of Shifting Sand Land. They are huge metal blocks wrapped in what seems to be cloth. They attack in a similar manner to Thwomps by slamming into the ground, while others move horizontally by jumping back and forth. The pyramid of Shifting Sand Land also features a new enemy similar to the Grindels, the Spindel, an enemy that rolls back and forth trying to squish whoever passes near it. In the DS remake of Super Mario 64, Super Mario 64 DS, the spike-less version of Thwomp is absent from the game, being replaced by the regular spiked version from Super Mario Bros. 3, Super Mario World and the modern appearance, though Mario, Luigi, Wario, and Yoshi are still able to stand on top of them to reach higher points. This time around, however, Thwomps can be defeated with the assistance of a Super Mushroom. Thwomps reappear in New Super Mario Bros., where they are found in World 4- , World 7- , and World 8- , and act as in Super Mario Bros. 3. Much like in Super Mario Bros. 3, these Thwomps can be defeated. Ways of defeating it included Shell Dashing, Mega Mushroom, or Starmen. A bigger variety is also featured here, with extra weight to break certain blocks, but with the same weaknesses as a normal Thwomp. Thwomps are once again present in Super Mario Galaxy, where they appear in several galaxies throughout the game, including the Buoy Base Galaxy, the Beach Bowl Galaxy (on The Cyclone Stone), the Dusty Dune Galaxy, and Bowser's Galaxy Reactor. This is the first game to feature Thwomps with two faces, one on both the front and back. In this game, Thwomps are much larger than in previous games, and cannot be defeated by any means. Thwomps in this game are once again spiked, though the spikes are blunt at the end and appear to have been carved, unlike their previous incarnations. Because of this, the sides of a Thwomp can be touched without taking damage; in some cases, it is actually necessary for Mario to Wall Jump off of them to reach certain platforms and areas. Additionally, if Mario stands on top of a Thwomp as it rises in the air, he can jump to carry the Thwomp's momentum into his jump and perform an extra high jump. In Super Mario Galaxy, Thwomps generally act the same as they do in other games, with waiting until Mario gets close to them and then smashing to the ground in an attempt to crush him. Others act as they did in Super Mario 64, constantly slamming against the ground regardless of Mario's location. If Mario does get crushed, he instantly loses a life, regardless of how much health he had. Contrary to the Thwomps appearing in Super Mario 64 and the Mario Party series, Thwomps in this game do not emit low-pitched grumbles when they talk or hit the ground. Their expressions, however, do change as they rise and fall. Thwomps later appear in New Super Mario Bros. Wii, along with the Big Thwomp and act the same way as in New Super Mario Bros.. In this game, they are a darkish gray sort of color, and their spikes are more realistic, unlike with Super Mario Galaxy. However, unlike the predecessor, Thwomps are very rare in this game, only appearing in World 1- . They may also appear during the Kamek boss battle in the World 8- ; his magic can occasionally transform a platform into a Thwomp, which immediately smashes through any platforms underneath it and plummets into the pit below. In this game, Thwomps can only be defeated by the Star power-up or a Simultaneous Ground Pound, with everything else doing nothing to them at all. Thwomps reappear in Super Mario Galaxy 2 where they behave just like they did in Super Mario Galaxy. They appear more common than the predecessor. Two Big Thwomps appear in the Supermassive Galaxy. They also appear in the Throwback Galaxy. Their most notable appearance is in the Stone Cyclone Galaxy, where their behavior is exactly the same as in the level Fast Foes on the Cyclone Stone in the Beach Bowl Galaxy. A new species of Thwomp called Rhomps made their debut in Super Mario Galaxy 2. They have one appearance in the Slipsand Galaxy, on the Sand Slide Planet. They attack by rolling towards Mario in an attempt to crush him. A new Thwomp species called the Flomp makes its first appearance in the same game. Flomps are platforms with a Thwomp-like face that move around, and when they rattle, their face turns angry and they flip over. If Mario or Luigi stand on a Flomp when it flips, it will knock them high into the air. Thwomps reappear in Super Mario 3D Land with the same tactics as in the Super Mario Galaxy titles, as well as appearance, except that now they show only one face like in previous games. They wait until Mario is near and attempt to crush him like before; however, they continue to raise and slam the ground continuously, even if Mario is not near them. They can be defeated if Mario is invincible, or by turning into Statue Mario beneath it; they try to crush Mario, and turn to rubble upon contact. A new species of Thwomp known as Tail Thwomp is introduced in this game, created when a Super Leaf is given to a Thwomp. They move about a set area using the Tanooki tail, then float in midair before slamming to the ground. Tail Thwomps attack in the same manner as the moving Grindel. If Mario jumps atop the tail, he will bounce slightly. Although not the same species as a Thwomp, a new species of Whomp is introduced in the game called a Wallop. These Whomp-like enemies are a wall with feet and a mouth and black eyes with yellow pupil that, instead of attacking Mario and Luigi, walk sideways to stop Mario and Luigi from getting past. Thwomps appear in the Nintendo 3DS game, New Super Mario Bros. 2, retaining their design from New Super Mario Bros. Wii. They attack using the same method as before. Big Thwomps also appear in this game. They can be defeated by a Super Star, Invincibility Leaf or a Gold Flower. Thwomps reappear in New Super Mario Bros. U and New Super Luigi U, behaving just like in past titles of the series. Their tiny counterparts, Thwimps, reappear in this game after a long absence since Super Mario World. The Thwomps can be easily dodged by distributing Boost Blocks below them. Thwomps reappear as enemies in Super Mario 3D World, mostly appearing in castle levels. They attack in the same way as in Super Mario 64 and can still be defeated in the same way as most previous Mario games. As with Super Mario 3D Land, Whomps are absent from Super Mario 3D World, but a new species called the Walleye is introduced. This creature is a species of Whomp that resembles a Wallop, except that it has hands and spikes on the front and sides and walks sideways to prevent Mario, Luigi, Peach, Toad or Rosalina from getting past it. However, if the characters are powered up, they can stun the Walleye and get past before it recovers. A new species of Thwomp called the Grumblump makes its first appearance in the same game. These Tox Box-like blocks appear in Grumblump Inferno and are the player's main means of navigating the level. They have similar faces to the Rhomps from Super Mario Galaxy 2 and behave similar to Tox Boxes. When Mario, Luigi, Peach, Toad or Rosalina step on a Grumblump, the smiling faces turn into frowning faces and it moves. If they ground pound the Grumblump, the faces will change to an angry face and it will temporarily speed up. This section is referring to a subject in an upcoming or recently released game. When the game is released, or more information about this subject is found, this section may need major rewriting. Remove this only when the changes have been applied. Thwomps are available to use in Super Mario Maker and Super Mario Maker for Nintendo 3DS, including a retro-designed version for the Super Mario Bros. art style, resembling their Super Mario World version. Unlike in other games, Thwomps do not rise to the closest ceiling above them after falling down, instead stopping at the height they were placed at. While editing a level, using a Super Mushroom onto a normal Thwomp turns it into a Big Thwomp. Giving them wings will make Thwomps flutter left and right. Thwomps can also be placed on tracks, from which they can permanently detach when they attempt to fall onto the playable character. Normal Thwomps can destroy Brick Blocks, although only one row at a time, unlike Big Thwomps which are capable of destroying a whole column in one smash. Thwomps are also able to press P Switches upon falling on them. The enemies can be stood on just as on a platform, though the player takes damage if they touch them directly. Conversely, the player can safely perform Spin Jumps on Thwomps. The Super Mario Bros. 3 Thwomps have had their palette changed to be more consistent with other games, and are no longer cyan. In the Wii U version, Thwomps can be shaken to create Skewers, though in Super Mario Maker for Nintendo 3DS, Skewers are standalone course elements. Thwomps reappear in Super Mario Maker 2 and now also have the ability to move horizontally, which is most likely a throwback to their Super Mario Bros. 3 appearance. They are able to crush objects this way, similar to how they would with vertical movement. 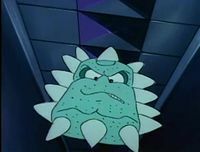 A Thwomp from "Never Koop a Koopa"
Thwomps make a few minor appearances in the The Adventures of Super Mario Bros. 3 television show. They serve as guards in Kastle Koopa during the episode "Never Koop a Koopa", and several Thwomps are shown to inhabit the Underground Maze of Pipes in the episode "Misadventures in Babysitting." A Thwomp also appears in "Do the Koopa", trying to crush Mario when he has the Doom Dancer Music Box. A Thwomp in "Send in the Clown"
Thwomps also make a few minor appearances in the Super Mario World television series, mainly serving as guards in the Neon Castle. In "Send in the Clown", Thwomps are utilized to prevent the Cave People from leaving Bowser's circus by blocking off the exits. In "The Night Before Cave Christmas", Thwomps appear much smaller, and they try to squash Mario and Yoshi. Some Thwomps appear among the crowds present at the International Mushroom Games in Leaping Lizards, and two appear in Koopa Capers, both of them in the Fortress; if Luigi decides to continue to explore the Fortress, instead of going through a newly-opened passageway, one crushes him in a particularly barren part of the structure, and if he chooses to try and get some coins that fall under some floating blocks sometime after entering the aforementioned passageway, he is crushed by another Thwomp, which is hidden among the blocks. 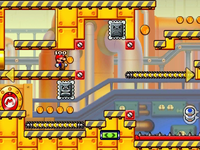 A group of Thwomps are guarding Magikoopa's fortress in Flown the Koopa, and depending on how the accompanying puzzle is solved, the Mario Bros. are either crushed by them, or make their way through the first three, and the fourth and final giant one by distracting it with some coins (which fall out of Mario's pocket when he tries to convince Luigi to use some of his cookies instead). Thwomps appear in the final battle with Bowser in Mario Pinball Land. They use the Super Mario 64 design. They appear on the left and right sides of the room, connected to chains. Behind them are two pulleys that when hit by Mario raise the Thwomps into the air, though they descend shorty after. When at least one of the Thwomps is raised as high as possible, it is suspended indefinitely and the blue button in the back of the room begins to glow. Hitting the button causes the Thwomps hit the ground, knocking Bowser over and making him vulnerable to attack. When Bowser curls into a ball and begins to roll around the room, the Thwomps are the first things he destroys, giving the player 50,000 points each. Thwomps make their first appearance in a spin-off game in Super Mario Kart as obstacles. They appear prominently in the track of Bowser's Castle, and a variant of them called Super Thwomps also appear in the track Rainbow Road. On the first lap of the courses they appear, they remain stationary in the air. On the second lap and so forth, though, they start to slam down to the ground. Furthermore, after landing on the ground, they move up to a height higher than the height they were at when they remained stationary on the first lap. Super Mario Kart is also the first game to not feature spikes on Thwomps. They are plain blocks of rectangular-shaped stones (setting them apart from the more modern square-shaped ones) and, once again, have their eyes as glowing white dots in a dark space. Also, these Thwomps feature cheeks, something that has not been reimplemented to date. Thwomps reappear in Mario Kart 64. Just like in its predecessor, Thwomps serve as obstacles in the course. 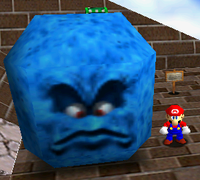 The Thwomps in this game take their appearance from Super Mario 64, being blue cubes that lack spikes. They appear in Bowser's Castle and try to flatten any player that races beneath them. They are often placed in strategic points so that the player is forced to pass under them in order to continue. There are also some Thwomps that move from one side to the other, trying to bump players on the ground and causing them to spin out if they are rammed at a high speed. This game may also be notable as the first time Thwomps have made any sound other than grunts, as some of them laugh as the players race through the area they are in. The laugh they produce is a slowed down version of Wario's laugh. There is also a Thwomp (nicknamed "Marty" by fans) that seems to have been locked up towards the beginning of the course; the light over it makes it appear green. In Mario Kart: Super Circuit, Thwomps appeared with two different models. The predominant ones are similar to Super Mario Kart's ones, and they are found in all the Bowser's Castle courses. The others are the regular spiked ones, who only appear after losing a race in Single-Pak Multiplayer, when Lakitu appears and drops one on each of the losing players. Thwomps (here called Thwomp Traps in the guide) re-appear in Bowser's Castle in Mario Kart: Double Dash!!. This is the first Mario Kart game to have them consistently appear with their spiked rectangular design. Thwomps appear in Mario Kart DS in both the Bowser's Castle course and GBA Bowser Castle 2 from Mario Kart: Super Circuit. Thwomps again return in Mario Kart Wii, using their Super Mario 64 DS appearance. Thwomps appear in all three of the Bowser's Castle courses in the game. Another Thwomp also appears in the battle arena called Thwomp Desert, hence the name. In this arena, a Big Thwomp is located in the center. It will fall down, causing a major shockwave that will hinder movement of the characters that get caught in it. It can also squish racers that are underneath it. Unlike the past Mario Kart titles (excluding Mario Kart: Super Circuit), players do not spin out by directly touching the Thwomps in this game. Going under the Big Thwomp in Thwomp Desert while it's up, players will fall into the quicksand. In the Bowser's Castle tracks, if a player gets flattened by a Thwomp, they will laugh similarly to the laugh heard in Mario Kart 64. The laugh is slightly different and higher pitched. Thwomps appear in Mario Kart Arcade GP on the Bowser Cup tracks. They are seen in the background and some are holding up signs. These Thwomps retain their design from Super Mario Bros. 3, and are in different colors. Thwomps reappear in Mario Kart Arcade GP 2 as one of Bowser's usable items. When the player uses it, if another player or CPU gets under it, it smashes that player. Thwomps appear as items in Mario Kart Arcade GP DX, now no longer exclusive to Bowser. There is also a large Thwomp that is seen after the factory section in the track Bowser Factory. It will rise up and crash down, but there are two platforms that prevent it from crushing racers. Thwomps also appear in Bowser's Castle and GBA Bowser Castle 1 in Mario Kart 7, taking their design from the Super Mario Galaxy games. Super Thwomps also reappear in SNES Rainbow Road, using their appearance in New Super Mario Bros. Wii. When these Thwomps hit the ground, the whole track begins to make a wave-like motion, and the player can do tricks off these waves if the waves are big enough. These Thwomps also knock back the player if run in to while on the ground, while normal Thwomps do not have this effect. Thwomps make an appearance in Mario Kart 8 and Mario Kart 8 Deluxe in Thwomp Ruins, once again taking their Super Mario Galaxy appearance. For the first time in the Mario Kart series, however, Thwomps do not make an appearance on the Bowser's Castle track. The Super Thwomps make a second return in SNES Rainbow Road that reappears the third time in the first DLC pack, The Legend of Zelda × Mario Kart 8; these Thwomps also use the Super Mario Galaxy design unlike in Mario Kart 7. They behave exactly the same as in Mario Kart 7, but when they land, they create rainbow waves above their heads and the wave-motions they create on the track are bigger than the ones in Mario Kart 7. Although Thwomps themselves do not appear in Donkey Kong for Game Boy, there is a type of block that behaves like a Thwomp. Mario can use them as a type of elevator, but they can squish Mario by pressing him against the ceiling. Thwomps appear in Wario's Woods as the ceiling that can fall on top of Toad while he is fighting the monsters that Wario sends out. Thwomps appear rather different in this game, as they are sometimes colored yellow and are more square shaped than their later appearances. Additionally, these are some of the largest Thwomps that appear in the Mario series, filling up the majority of the screen when they fall. In Super Mario RPG: Legend of the Seven Stars, Thwomps act as obstacles and cannot be fought like normal enemies. Like in their sidescroller appearances, Thwomps attempt to crush Mario if he walks by, knocking the plumber unconscious for a short period of time if they succeed. One Thwomp appears on a staircase in the Pipe Vault. When this Thwomp crashes to the ground while Mario is climbing up, the plumber tumbles backwards down the stairs. Thus Mario must jump up the staircase quickly before Thwomp has a chance to strike. The same occurs when the Thwomp lands on him. Additionally, two Thwomps in Booster Tower rest on teeter-totters. When Mario hops on the other end, the Thwomp flies up, smashes its own end, and sends Mario soaring high up in the air; one sends him further up into the tower, and the other lets the player hit a Treasure Chest. There is also a Thwomp living with a Chow and a Piranha Plant in the second room in Monstro Town, who appears to be jealous of Mario's jumping skills. Every time Mario speaks to him, the Thwomp slams the ground, causing the Temple Key on the ledge above to slowly move over and eventually fall to the ground. Additionally, near the room where Boomer is battled in Bowser's Castle, there are several Thwomps that attempt to crush Mario as he passes by. At the end of this series is one Thwomp that is bigger than any other Thwomp in the game; however, it retains the same effect as normal Thwomps. In one of the tunnels on the waterfall half of the Midas River minigame, the player can find a Crook attempting to dodge Thwomps to avoid losing its coins, but continuously failing. 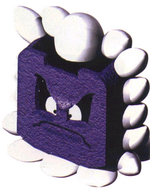 Physically, Thwomps look much like they first looked back in Super Mario Bros. 3. Although a bit gloomier and darker, fitting the Super Mario RPG graphical style, Thwomps return full-spiked and with a prominent spike on their head. These Thwomps are also the first ones to finally have their eyes correctly depicted as they look in the official art. Also, the Thwomps that appear in this game are the first 3-D appearing Thwomps in the Mario series. Thwomps have been active non-playable characters in the Mario Party series. They usually appear in minigames or as obstacles in the different boards, but have also appeared as items. 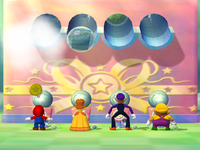 In the first six Mario Party games, the Thwomps appear in their Super Mario 64 design. 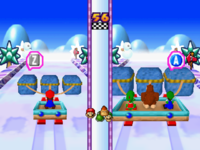 In Mario Party, Thwomps appear as board obstacles as well as minigame obstacles. In the minigame Running of the Bulb, Thwomps served as obstacles that did the best a Thwomp can do - try to squish the player, stunning them temporarily. The stone baddies also had a small appearance in the minigame Skateboard Scamper, trying to slow down the player. Thwomps are also obstacles in Yoshi's Tropical Island. Here, the player has to pay a determined number of coins to pass through the area which the Thwomp is guarding. When another player tries to pass by them, they must pay at least one more coin then the last player payed to pass by; the amount can only go up to fifty before resetting. They usually cover shortcuts that take the player to the star faster in dispute. Thwomp is also part of the celebration of the winner in this game. In Mario Party 2, Thwomps return in the same fashion as before. They block paths in boards such as Pirate Land, forcing the players to pay if they want to take the route. In the board Space Land, if a player lands in a Happening Space, they trigger a Thwomp event. This Thwomp will drive space cars and chase the player to the other side of the board, as well as any other player found in the way, although they can be chased away by the Snifit Patrol speed trap. Thwomps also appear in several minigames besides the ones transferred from the first Mario Party. One of those games is Day at the Races, in which Thwomp is one of the selectable CPU-controlled racers. Thwomp has the ability to jump forwards at great speeds, but it stomps the floor when it lands, and there is a few-second interval before it jumps again. In Mario Party 3, Thwomps do the same as earlier games and present the same physical appearance. In this game, Thwomp is highly featured in the board Creepy Cavern. Thwomp either stops players and offer them to ride the mine cart for five coins, or he will chase players from one side of the board to the other when they stepped on a Happening Space positioned over the cart's tracks. As usual, Thwomps are featured in minigames. However, in this installment, Thwomps get their own minigame: Thwomp Pull, a 1 vs. 3 minigame in which Thwomps pull the player through the snow and only obey if the players press the correct series of buttons. Thwomps also appear in the puzzle minigame Mario's Puzzle Party (which later appears in Mario Party DS). They only occasionally appear, and when they do, they crush the blocks beneath them, making them half the size they once were. A Thwomp is also a partner in Duel Mode in Mario Party 3. It is nobody's initial partner, but can be obtained in the roulette. 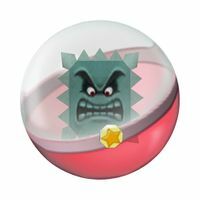 Thwomp has 0 attack and 2 HP, but it also has the ability to defeat any partner instantly, though it does nothing against players. Thwomp's salary is four coins per turn. Additionally, when the player obtains two Thwomps as partners, instead of having their attack boosted by one, the Millennium Star instead decreases their salaries by one. In Mario Party 4, Thwomps achieve a much bigger and influential role in the game, alongside its cousin Whomp. In this game, it hosts Thwomp's Backroom Ball, a series of bonus minigames. These minigames are Mega Board Mayhem, Mini Board Mad-Dash, Challenge Booksquirm and Panel Panic. The first two challenge the player to get as many coins as possible without the use of minigames. The third one is the Booksquirm minigame, except it challenges the player to see how many pages they can pass without getting squashed. The fourth one consists of a survival 4-player experience involving Dice Blocks. Thwomp also states that it built the boards from the first two himself, and that it took several months. Besides this special role, Thwomps retake their role as a board obstacle and a minigame non-playable character. However, they only have one minigame appearance, in the minigame The Great Deflate. In this game, rubber, transparent blue-colored Thwomps appear. The objective is for one team to deflate the inflatable Thwomps before the other. Vicious Vending from Mario Party 5. Princess Daisy had received a Thwomp. Thwomps return with a reduced role in Mario Party 5. One appears on a single board, Pirate Dream, in which Thwomp gives the players a lift to a higher point of the board for ten coins. In minigames, Thwomps are not especially featured either. In Vicious Vending, they are one of the possible prizes the player can get from the machine, although it makes the player lose. In Squared Away, Thwomps surround the fighting area and chase the losers once the minigame was over. In Mario Party 6, Thwomp becomes even less recurring by losing active roles in game boards or background elements. In minigames, Thwomps still aren't featured much. There is a Thwomp that squishes the player when someone chooses the wrong card in Odd Card Out. In the minigame Tricky Tires, Thwomps return as the usual obstacle that stops players' cars from advancing. There is also a Thwomp in the minigame Sumo of Doom-o, which stomps the ground and causes part of the platform the players are on to fall off. In Cog Jog, a Thwomp stomps the floor, but this reverses the rotation of the cogs. In Shoot Yer Mouth Off, saying "Zero" into the microphone triggers three Thwomps to fall in random locations of the area. In Speak Up, Thwomp is one of the "objects" to be counted in the Comparison Quiz. Thwomps are also in the minigame Seer Terror; when the player pulls a rope, a Thwomp may fall on them. Additionally, Thwomp appears as an Orb that can be obtained in the game board. Players that pass under the designated Thwomp Orb space are crushed, ending their turn. This is the last game that Thwomps use their Super Mario 64 design. Thwomp once again returns in Mario Party 7, but receives a transitional physical change. 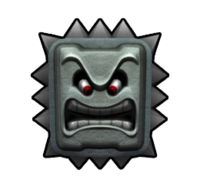 Unlike the Thwomps of previous Mario Party games, which had used their appearance from Super Mario 64, the Thwomps of this game now look more like they did in the days of Super Mario Bros. 3 and Super Mario World, although their expression is severely different, in that it looks more mad than the official art, and their prominent spike is gone. They are now again gray and possess most of the characteristics of the old Thwomps. Despite this physical change, Thwomps are not able to return to game boards and have the same roles as Mario Party 6. In the minigame Take Me Ohm, Thwomps activate the Ohms that are shot at players. In Number Crunchers, the solo player needs to use Thwomps in order to squish the other players. In Spin Off, one of the characters to be formed is a Thwomp. Also, the Thwomp Orb returns with the same effect as in Mario Party 6.The Thwomp's design is the same as the ones from Super Mario 64 DS. In Mario Party 8, Thwomp is once again absent from game boards, and it sticks to its look shown in Mario Party 7. They still appear in minigames, though. In Balancing Act, Thwomps appear as obstacles in the course. They also make an appearance in Cardiators as one of the cards. A Thwomp is also one of the racers in the game Moped Mayhem. In Specter Inspector, a Thwomp is among the characters that must be found in the room. There is also an item in this game that is based upon Thwomps, named Thwomp Candy. Eating a piece causes the player to turn into a stone version of their head, and running into an opponent causes the player to fall on and flatten them, destroying half of their coins. Thwomps, retaining their appearance from Super Mario 64, make an appearance in Mario Party Advance. A unique Thwomp appears in Shroom City at the Thwomp House, where he asks the player for help after being robbed. Generic Thwomps also appear in various minigames: in Outta My Way!, Thwomps act as obstacles to be shoved forward; in the minigame Chain Saw, the players must saw a chain suspending a Thwomp above the other player, which causes the Thwomp to fall and flatten one of the players; and in the minigame Chicken!, the objective is to stay under the Thwomp as long as possible and flee before the opponent or before the player is crushed. Thwomps barely appear in Mario Party DS, as Whomps appear the most in the game. The only part of the game where Thwomps are shown is in the puzzle minigame Mario's Puzzle Party, from Mario Party 3 (and therefore appearing as their model from the Nintendo 64 games, notably Super Mario 64). Thwomps once again have a minor appearance in Mario Party 9. They only make one appearance, in the minigame Thwomper Room, which involves the players dodging them as they fall to the ground. They open their eyes as they are about to fall, allowing the player to move out of the way before they do. Their appearance is the same as their look in New Super Mario Bros. Wii. Thwomps also have their own constellation that can be purchased at the Museum, named "Riled Rock." A single Thwomp in its Super Mario Galaxy design appears in Mario Party: Island Tour on the Perilous Palace Path board. Whenever a player reaches the bridge, they have to guess which button will lower the bridge. If they choose the wrong one, they will get squashed by the Thwomp and will remain in that area until somebody is able to lower the bridge. 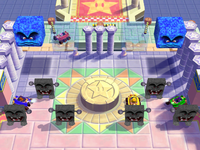 In Mario Party: The Top 100, Thwomps appear as obstacles in the returning Mario Party minigame Desert Dash. The Great Deflate from Mario Party 4 also returns, as do the inflatable Thwomps. These Thwomps now have their modern facial design, but retain their original blue, cubic shape. Thwomps appear in Super Mario Party as non-playable characters. Thwomps and Big Thwomps alike are potential obstacles in the minigame Follow the Money, deducting coins from players they crush. In Rattle and Hmmm, a Thwomp can appear alongside a Whomp and a Sumo Bro. One Thwomp appears in Kamek's Tantalizing Tower, and two in the board's Partner Party variant, Tantalizing Tower Toys. In both variations, Thwomps hover over paths that players can use, but must pay coins to be granted access. Unlike the Whomps, who have a set number for their coin toll, Thwomps demand to be paid more coins than the last player whom had been let through. Kirby's Thwomp transformations in Super Smash Bros. Brawl (left) and Super Smash Bros. for Wii U (right). 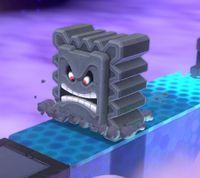 A Thwomp in its Super Mario 64 appearance is one of the types of stones Kirby can transform into in Super Smash Bros. Melee and Super Smash Bros. Brawl when using the Stone move. In Super Smash Bros. for Nintendo 3DS / Wii U, the Thwomp transformation has the same appearance as in New Super Mario Bros. Wii. In Super Smash Bros. Ultimate, a Thwomp appears as an Assist Trophy. It attacks by slamming down on fighters that are below them. Kirby's Thwomp transformation also reappears. A Thwomp also appears in the game as a support spirit, granting resistance to melee weapons when equipped. It can be summoned using a Rock Pikmin and Rocky core. In Mario Golf: Toadstool Tour, Thwomps appear as obstacles in the Bowser Badlands course, appearing identical to their appearance in Super Mario 64. There are major lava areas around the courses, and they act as obstacles like other enemies, such as Bob-ombs and Boos, do also. They also reappear as obstacles in Mario Golf: Advance Tour, also in their blue incarnations. In Advance Tour, they first appear on Hole 9, blocking the player in the second green area. Thwomps reappear in Mario Golf: World Tour where they will once again serve as obstacles on the Bowser golf course, this time Bowser's Castle. However, they now appear in their gray, modern form. In Mario Hoops 3-on-3, Thwomps appear on the Bowser's Castle court. They occasionally appear out of ? Panels. Thwomps retain their function from other games, slamming the ground and flattening any player underneath them at the time. A single Thwomp appears in Mario & Sonic at the Olympic Winter Games. It blocks the path to a certain area in Frostown. To move it, the player has to get Princess Peach to blow kisses at it. This causes it to raise and allow the heroes to pass by. Thwomps also appear as obstacles in the Dream Ice Hockey event, casting a shadow on the area they are about to fall onto and stunning any player caught beneath them. They can either be normal sized Thwomps, or occasionally massive ones. Thwomps act as obstacles in Dream Rafting in Mario & Sonic at the London 2012 Olympic Games. They are the second obstacle to be cleared. They attempt to pound the raft, causing it to float underwater and forcing the team off of it. After passing by the Bob-omb barrage at the beginning of the course, Two Thwomps appear. Later, after passing by a group of Cheep-Cheeps, there is a cavern with several Thwomps along one route; taking the alternate route allows the player to bypass them. Thwomps act as obstacles in Equestrian Plus in Mario & Sonic at the Rio 2016 Olympic Games. If the player gets hit, they will get a ten-second penalty. In Mario & Luigi: Superstar Saga, two Thwomps appear in the Hammerhead Bros.'s cave after they move from Hoohoo Mountain to the Beanbean Kingdom Outskirts. The Gray Rocks and Black Rocks inside their new home can be destroyed as they upgrade Mario and Luigi's hammers, revealing a Thwomp in one of two featureless rooms. They explain that they want to play a game, charging Mario and Luigi 200 or 500 coins respectively to destroy one of three stones that he summons down. The gray stones that have a chance of containing 200 coins, 300 coins, Secret Scroll 1 (which teaches Swing Bros.), or for the black stones that require a payment of 500 coins gives the player a chance on getting either 500 coins, 800 coins, Secret Scroll 2 (which teaches Cyclone Bros.), or nothing. 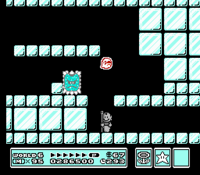 The Thwomps have a similar design as in Super Mario Bros. 3 again, except they are gray. In Mario & Luigi: Superstar Saga + Bowser's Minions, the Thwomps are redesigned to have their appearance from Super Mario Galaxy. In Minion Quest: The Search for Bowser, a Thwomp is used in one of the Captain Commands, which is Thwomp Thump. Its impact and self-inflicted damage can be avoided with a well-timed jump. Mario & Luigi: Partners in Time shows a female Thwomp named Mrs. Thwomp, who strangely looks like a huge boulder instead of an average Thwomp. She, along with her husband, Mr. Thwomp, appears at Thwomp Volcano. Mr. Thwomp does have the appearance of a Thwomp, but without spikes on the sides and on top of him. The Thwomp Bros. inside the volcano challenge the Mario Bros. to minigames. There are many different prizes the player can win from these minigames. An unnamed Thwomp also appears to help the Mario Bros. descend into the depths of the Volcano. After the player defeats Bowser and Baby Bowser, they are standing on the Thwomp when the volcano erupts again, sending them flying into the air; Baby Bowser remains on the Thwomp when it lands on the Shroob Mothership. Tanoombas can also turn into Thwomps, as their statue form. In Mario & Luigi: Bowser's Inside Story, several new species of Thwomps are introduced. There are bone-like Thwomps in Bowser's stomach in the Pump Works and the Airway, called Bone Thwomps. Besides that, there are Thwomps with colds called Sniffle Thwomps in Bowser's Castle that act as enemies, as well as Shadow-like Thwomps that appear in the battle against Dark Bowser and Dark Star Core. They use the same tactics as in the platforming Mario games, and can be avoided by having Bowser crouch into his shell. Additionally, special brown-colored Thwomps appear during the game that are thrown by Junker and Junker X. They are thrown into the air, and attempt to slam down on one of the two brothers that has a garbage can on their heads. Mario and Luigi must jump to avoid being crushed or running into them. In Mario & Luigi: Bowser's Inside Story + Bowser Jr.'s Journey, the Thwomps were redesigned to match their appearance in Super Mario Galaxy. The Thwomp Thump captain command also returns in the Bowser Jr.'s Journey mode. Thwomps appear as part of Kamek's third battle in Mario & Luigi: Dream Team. Whenever Kamek chases Mario, there are continuous rows of three Thwomps each. Mario must pay attention to the Thwomp(s) that fall first and move there, since the other Thwomp(s) will fall soon after. Eventually, if the attack is dodged successfully, there is a final row of Thwomps that will fake out Kamek and hit him instead. Thwomps reappear in Mario & Luigi: Paper Jam, in the Toad Trail Attackathon, where they serve as obstacles for the Mario Bros on ground. If rammed into head-on, the player instantly loses the challenge. They also appear during the boss fight against Dry Bowser. In one of his attacks, he summons Thwomps to crush the bros. before spewing a torrent of flames. If all three Thwomps are countered, they will be burnt by the flames, causing them to take turns jumping on Dry Bowser as they hop off, leaving him vulnerable. In Mario vs. Donkey Kong, Thwomps appear in different levels in Spooky House stages of the game. They have a design very similar to Super Mario World. When Mario approaches them, they roar and then fall down. Mario dies immediately if he touches them. Thwomps reappear in Mario vs. Donkey Kong 2: March of the Minis, as well as similar enemies called Kongās. They have the same roles as the previous game, being enemies in some levels. They first appear in the third world. Thwomps reappear once again in the game Mario vs. Donkey Kong: Minis March Again!. They again have the same roles as the first game, being enemies in some of the stages. They first appear in the game in Room 6-3 along with other enemies. Thwomps are once again enemies in Mario vs. Donkey Kong: Mini-Land Mayhem!, appearing in Area 6-3, Area S-18, Area X-6, and Area X-8. Thwomps reappear in Mario vs. Donkey Kong: Tipping Stars and act the same as in prior installments. They are introduced in Runaway Warehouse. Of note is that if a Thwomp crashes down on a conveyor belt, it will get carried in the designated direction for a short time, before rising back up. While Thwomps themselves do not appear in Paper Mario, a species of Thwomp called Spiny Tromps occasionally appear. They attack Mario by rolling toward him. Mario and Goombella encounter a Thwomp in Shhwonk Fortress. Two Thwomps appear in Paper Mario: The Thousand-Year Door, both of which ask several questions in a game-show manner in order to test Mario. If Mario guesses five questions correctly before getting three incorrect, the entrance to the inner sanctum of the Shhwonk Fortress (with the first Thwomp) and the Elevator Key (with the second Thwomp) are revealed to Mario. If the player fails the quiz, they summon enemies to attack the player. One Thwomp is found over the entrance of Shhwonk Fortress, while the other, more robotic-looking Thwomp is inside the X-Naut Fortress. The quizmasters have identical personalities to the Guard Door from Paper Mario. This block-headed rocker really loves making pancakes. All that macho pounding must be a sign of insecurity. In Super Paper Mario, only five Thwomps appear in the entire game. They are all found in Chapter 1-2, located in an underground area below Yold Town. They only attack by quickly and continuously slamming the ground and rising back up to the ceiling, like in their previous appearances except with a star. Thwomps cannot be defeated, and the only way to avoid them is for Mario to flip to 3-D and walk past them. Using Pixl attacks only momentarily stops them; grabbing one as Thoreau makes it sweat as well, and Fleep makes them spin in place for a while; they return to their periodic attacking afterward. Like with the previous game, they have a similar appearance to their appearance from Super Mario Bros. 3, having a prominent spike on top surrounded by several other spikes; their specific stylization resembles their appearance from Mario & Luigi: Superstar Saga. In this game, Thwomps are shown to have faces on both sides of their bodies. This game also includes Spiny Tromps from the first game. They appear on Mount Lineland and Underwhere Road and, like their species of origin, cannot be defeated, only avoided. Four Big Thwomps made out of cardboard appear in Paper Mario: Color Splash. Like many other enemies in the game, they use their designs from the main series rather than their design from the first three Paper Mario games. A few Thwomps appear in Mario Superstar Baseball as obstacles in Bowser Castle. They try to stop any of the players from making home runs. They also appear in the unlockable minigame Star Dash and try to smash anyone who is beneath them. If a player gets smashed by a Thwomp, they lose some of their coins. Thwomps appear in Mario Strikers Charged at The Sand Tomb. They only stomp on the brown rocky area. They do not fall on the sand, but the sand slows down the characters' movement considerably. When a Thwomp falls on a character, the character is stunned for a certain amount of time. Thwomps appear in Super Princess Peach. They first appear on Bowser's Villa 8-1, where there are several of them that Peach must pass by to get to a Toad. Their method of attack is the same as in past Mario platformers, where they fall when Peach is nearby. They cannot be destroyed. There is also a massive Thwomp that takes up the entire background in three rooms. If Peach does not perform the action shown by the statues when the Thwomp opens its eyes, it inhales her, sending her back to the entrance of the room. A Thwomp appears in the Yoshi series game, Yoshi's Cookie as one of the three final bosses. They make a very minor appearance, as they only appear on Stage 6. The Thwomp is followed by a Magikoopa, and a best-out-of-5 match against Bowser. 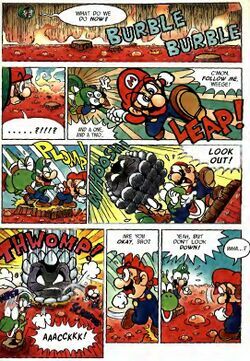 In Super Mario Adventures, Thwomps first appear in chapter 7 of the comic. They make only a very minor appearance. After Yoshi trips over Wendy's foot, he rams into Princess Peach, Toad, and Friendly Floyd. She then pulls a rope, causing several Thwomps to fall on top of them. Thwomps later appear in chapter 11. Many of Bowser's minions are gathered at Bowser's Castle to witness Bowser's wedding with Princess Peach. Luigi eventually finds a Warp Pipe that he thinks might bring him, Mario and Yoshi inside the wedding area, but it instead warps them to a cavern filled with lava. The group jumps on a rock platform, but a Thwomp is above. The group is able to leap to another platform, before it falls on them. 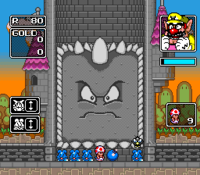 Thwomp's appearance in Super Mario Adventures is similar to their appearance in Super Mario Bros. 3. They also have the prominent spike, and are a dark blue color. Thwomps appear also in the thirty-fifth volume of Super Mario-Kun, which is almost exactly based off of Mario & Luigi: Partners in Time. Almost all the events from the game happen in the comic, such as battling Mrs. Thwomp. Thwomps make an appearance as enemies in the game, Puzzle & Dragons: Super Mario Bros. Edition. They're often found at the castle courses, and their main attribute is Light. Big Thwomps are also present, along with a mash-up called Thwomp & Thwimps, which consists of a single Thwomp paired with two Thwimps. The Big Thwomp, along with the Thwomp & Thwimps, have Light as their main attribute, while their sub-attribute is Dark. The Thwomp's skill can deal damage to all enemies, equal to half of its ATK value; the Big Thwomp's skill deals damage to all enemies, equal to its ATK value; the Thwomp & Thwimps's skill can deal damage to all enemies, equal to 2x its ATK value. Also, the Thwomp & Thwimps's Awoken Skill raises the HP value of all teammates once it has been awakened. All Thwomp variants have HP as their strongest stat, while their ATK is at or below average levels. Lastly, their RCV is set at 0. In Kirby 64: The Crystal Shards, an enemy known as I3 appears. I3 acts like (and is most likely based off of) a Thwomp. Thwomps were originally part of Bowser's moveset in Skylanders: SuperChargers. However, it was eventually decided that Koopa Troopas were a better fit. In the Super Mario Mash-Up Pack in Minecraft, Slimes are replaced by Thwomps. Slimeballs are replaced by Thwimps. In Monopoly Gamer, two Thwomp spaces replace two of the traditional Railroad Spaces on the game board. Landing on the space forces a player to drop two Coins on the space, which may then be picked up by the next player who lands on or passes over the space. Thwomps made cameo appearances in a few The Legend of Zelda games, including The Legend of Zelda: Link's Awakening, its 1998 remake Link's Awakening DX, and again in Oracle of Ages and Seasons. In these games, Thwomps are enemies found usually in dungeons. Although they have the Thwomp essence in them, these Thwomps are quite different to the previously seen ones. There are three types of Thwomps in these games. The first one is a Spiked Thwomp. These have small spikes beneath their chins and on the sides, but above they are perfectly plain. Unlike Mario series Thwomps, these also feature a single eye. They are, additionally, brownish in color, though colored blue in the Oracle games. When Link gets close, it looks at him with an evil grin, similar to the alert pose in Super Mario World. Link can safely walk upon their flat heads, but not defeat them. The second type of Thwomp is referred to as Mega Thwomp in English, but is given a name more similar to that of normal Thwomps in Japanese. It is a large red square. This one has an angry expression and two eyes. It also simply hangs in the air over a pit of spikes and doesn't attempt to crush Link. Link must use the Pegasus Boots to ram into it, turning it blue and giving it a shocked expression, as well as knocking it down. Link can then use it as a platform to cross the spikes. The third type is simply called Thwomp, although the Japanese versions identify it instead with Thwimp, which it more closely resembles. These act much like the Thwomps of the 2D Super Mario series games, waiting for Link to approach, then slamming the ground when he gets close. These are cycloptic, like the Spiked Thwomp, but have spikes like Mario franchise Thwomps. Much like the others, they are square. They appear as blue while hanging in the air, but turn red and angry when attacking. Link can use the Pegasus Boots to run underneath them, or goad them into dropping and passing under them while they rise back up. They are invulnerable. Finally, there is a Thwomp boss called Head Thwomp, seemingly their king, who is fought as the second boss in Oracle of Ages. It features four faces (an evil grinning blue, a grumpy purple, an angry green, and a surprised red), which it rotates through rapidly. When a bomb is thrown in it open head it will spin furiously and land on the same face as when the bomb landed in it. It will then perform a function specific to that face: the blue one will shoot rotating energy balls that orbit in wider circles until they leave the screen, the purple one will smash into the ground, the green one will spit fireballs across the stage, and the red one will cause damage to itself. Four red faces will cause it be destroyed. In The Legend of Zelda: Four Swords Adventures, Thwomps resembling the Mega Thwomps appear, acting instead like the Spiked Thwomp. However, due to the smooth sides, Link will not take damage from simply touching them. 02/90 Thwomps spend most of their time suspended in midair, waiting. When Mario passes below, they crash down with amazing speed. As you may guess from their appearance, they're heavy and solid enough to make any attack on them futile. Small ones are called Thwimps: despite their weight, they often form groups and bounce around. You can't reason with a Thwomp. If you get close enough to try, it will just drop down to block your path. In fact, you can count on Thwomps to always do exactly that—they've gotten really good at it. A Koopa I know swears they work great as a home-security system... Have you ever wondered what it would be like to have a Thwomp of your own? If anyone tried to break into your house, it would just go "THWOMP!" right on their head. Yep, a Thwomp would make a great home-security system. Unfortunately, they're not available in shops. Sad time. For this subject's image gallery, see Gallery:Thwomp. Dossun From dosun, crushing sound in Japanese; alternatively romanized as "Dosun"
↑ Nintendo Power Volume 13, page 9. ↑ Grimm, Steven. (2003) Mario Kart: Double Dash!! Official Nintendo Player's Guide. Page 91. ↑ GameXplain. (February 24, 2015). Mario vs Donkey Kong: Tipping Stars - Overview Trailer (Japanese). YouTube. Retrieved April 5, 2015. ↑ Nintendo. (June 17, 2015). Nintendo Treehouse Live @ E3 2015 Day 1 Skylanders SuperChargers. YouTube. Retrieved August 14, 2015. Mario • Luigi • Princess Peach • Princess Daisy • Yoshi • Birdo • Wario • Waluigi • Donkey Kong • Diddy Kong • Bowser • Bowser Jr. This page was last edited on April 19, 2019, at 09:49.